Skykomish (known affectionately by railway employees, rail fans and it's citizens as "Sky") got its start in life from the Great Northern Railway. It all began in 1889 when James J. Hill (the Empire Builder) decided to extend his railroad to the Pacific Coast from Montana. Mr. Hill hired John F. Stevens to be the chief locating engineer to determine the route of the railroad. (Mr. Stevens later became the builder of the Panama Canal and the reorganizer of the China-Trans Siberian Railroad). After discovering Marias Pass in Montana Mr. Stevens continued west to Spokane and the Columbia River. Here he began the exploration of the Cascades to determine the best route to the coast. This lead to the discovery of the pass bearing his name, seventeen miles east of what was to become the town of Skykomish. In his travels Mr. Stevens met John Maloney. He hired him to help his engineers with the survey and construction of the railroad. He also advised Mr. Maloney to develop a homestead here because he felt that it would become an important point in the operation of the railroad. Mr. Stevens later became involved in several logging and sawmill ventures in the area. During the construction of the railroad in 1892, the soon to be town, was known as Maloney's Siding. The depot was a boxcar sidetracked for this purpose. 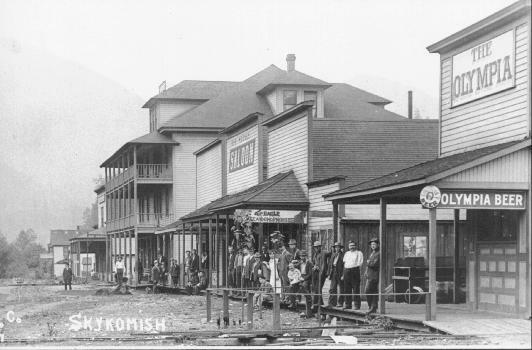 After completion of the railroad in 1893 a post office was established and the town became known as Skykomish. The town was platted in 1899 and it was incorporated on June 5, 1909. Mr. Maloney built a store to supply the needs of railroad men. Frank Wandschneider built a hotel to accommodate the men. The original store is still here but the hotel burned in 1904. Today's Skykomish Hotel and Restaurant was built in 1905 by D.J. Manning. The restaurants and card rooms were open twenty-four hours a day to accommodate the railroad crews. Card games consisting of poker and panguingue (pan) were the favorites of railroad men to pass the time between calls to work. 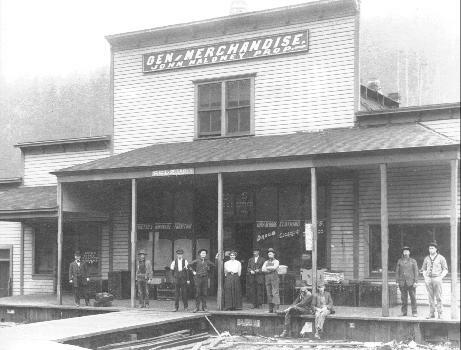 The first scheduled train went through Skykomish on June 18, 1893. The engineer on this first train was Patrick McEvoy. Mr. McEvoy later settled here and in 1897 opened a saloon that became a gathering place for railroad men he knew during his railroad days. Originally known as the Olympia it still prospers as the Whistling Post Tavern. The first depot, a roundhouse, a coal chute and a water tank were built in 1894. From 1894 to 1922 the division point of the railroad shifted several times between Goldbar and Skykomish. In 1922 the division point was moved back to Skykomish. The original depot that was built on the south side of tracks was moved to the north side of the tracks where it is today. 1922-1923 was a period of change in Skykomish. Besides the moving of the depot, a hotel was built by Mr. Hatley. It is now known as the Cascadia. This replaced what was originally Martin's Boarding House. Also many of the shack like buildings that were along the tracks on the southside of the street were removed and the area cleaned up. Later a small park was built and maintained by the Great Northern on the west side of the depot. Today the park is maintained by the Skykomish Lions Club. Many of the changes were probably made anticipating the electrification of the railway and the eventual construction of the present eight mile Cascade Tunnel. 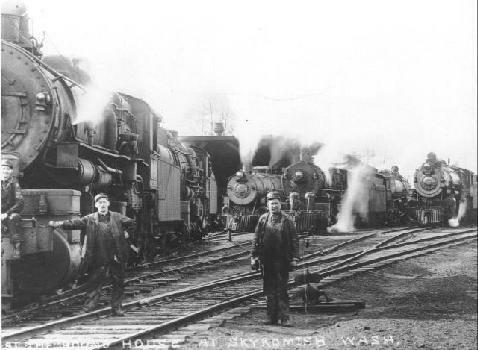 On March 5, 1927 electric engines began operation from Skykomish east. In 1956 a ventilation system was installed in the Cascade Tunnel to permit the operation of diesel engines through the tunnel. On July 31, 1956 the last electric engine left Sky. This was probably the beginning of the end of the glory days of railroading in Skykomish. Helper engines were added to and removed from the trains for a few more years. But eventually even these were eliminated to a large extent. 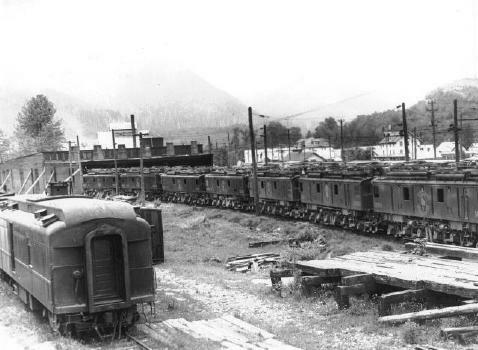 At one time eight passenger trains a day stopped in Skykomish. (Eight mail deliveries per day!) During the passenger train era some of the finest passenger trains in America stopped in Sky - the Great Northern Flyer, the Oriental Limited, the Cascadian, the Western Star and the Empire Builder. Also there was a train affectionately known as the "Dinky" that went to Seattle in the morning and returned to Skykomish in the evening. The last passenger service ended in May 1971. Today about 20 trains a day pass through Sky with their shipments of products from all over the United States and many foreign countries. Amtrak's "Empire Builder" passes through west in the morning and east in the evening enroute between Seattle and Chicago. In December 1970 the business district was nearly destroyed by a fire. The fire destroyed the old false front buildings between the Skykomish Hotel and the Whistling Post Tavern that gave the town the western frontier look typical of so many railroad towns where the tracks were "Main Street". The steam and electric engines are gone, the wooden cabooses and boxcars are a thing of the past. But the romance of the railroad lingers.